Hi Anthony, I had an interesting chat with some other TEFLers and 1 person was positive that pre-CELTA teaching really helped him on his CELTA. This would fit in with reflection but do you think it’s important to only accept people with some teaching exp or even to recommend they get some before starting? I replied that I thought prior language teaching experience was less important to me than prior language learning experience, and this post started life as an explanation of that view. However, it also got me thinking about the whole issue of experience and the problems related to working with it. The question of whether some prior teaching experience is useful in providing an experiential basis for reflection during short intensive training courses like Celta is an important one, and it relates to several other big questions doing the rounds at the moment, like the nature and status of ELT (is it a trade or a profession? 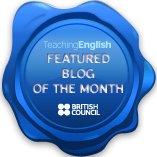 – currently being disputed over at ELTMythTakes and at #ELTChat) and the theory of learning implicit in teacher training. I spend most of my time these days working with people who are working towards the Cambridge ESOL Celta at our centre in Hamburg. Some of these people have prior experience, some of them don’t, but they all have something in common: they have all tried to learn at least one foreign language as an adult. They have this in common because we do not accept anyone onto our course if they haven’t done this. Looking back, it is clear that candidates whom we accepted without prior adult language learning experience had a harder time on the course – both in our judgement and in their own. When it comes to prior language teaching experience, however, the picture looks rather different. Statistically speaking, prior teaching experience does not correlate with high performance on our course (taking final grades awarded as an indicator). People with no prior teaching experience have been known to receive top grades; people with years of experience have been known to fail or pass with extreme difficulty . This begs the question: why is this so? The answer may not be comfortable. Several voices out there online have suggested recently that an unplugged approach to teacher training could benefit from someone gaining some teaching experience before embarking on a course of training. The idea is that this would allow the teacher within the person to emerge, preserving its native qualities. Under the right conditions (i.e. the live classroom) with the right stimulus and feedback (i.e. the learners) and possessing the right mindset (i.e. an enquiring and flexible intelligence), a novice teacher could start to develop a conceptual framework and experiential base. Equipped with this, they could come to a short training course such as Celta with much more robust knowledge about teaching and learning, making the training experience richer. Scott Thornbury used his own grandfather as a case in point, as I recall, when debuting his talk Six Big Ideas (and one little one) in Berlin. I certainly don’t deny that this is possible, though it does obviously rely on a person being highly observant, sensitive to changes in the classroom ecology, analytical, adaptable, and confident in their own judgement – all qualities, in fact, that would mark someone as being suited to teaching. However, I do think that course providers (and I include myself in this) may not be making the best of what trainees with prior experience bring to a course like Celta. The heading you’ve just read is a frequent comment to be found on interview notes made by tutors who screen applicants for courses like Celta. I’ve written the same kind of thing many times over the years. Phil’s comment made me question it seriously. The implication is that the presence of prior experience may impede the candidate as a result of ingrained belief and habit. Of course, there is much more behind the comment than that. For example, there is the implication that the candidate should adapt their beliefs and approach in the light of experience and information gained during the course. This further suggests that the interviewer already senses a divergence between the prospective trainee’s theory of learning and teaching and that of the course trainers’. Put these two implications together and you come to this conclusion: the prior experience of the prospective teacher is corrupt and they would be better off as a blank slate. Speaking from experience, I know how hard it is on a short intensive course with several candidates to take each individual’s learning needs and background fully into account while working with them. As we are the ones with the syllabus and the criteria, and the candidate comes to train with us, it can be very easy to operate on the assumption that the onus is on them to “adapt”. But where do we draw the line between “adapt” and “conform”? And why should “training” be a one-sided exercise? Busy, overworked trainers on short intensive courses may, in their darker moments, pray for blank slates and some good old transmission training – the Jug ‘n’ Mug metaphor. It’s quick, it’s efficient and it would ensure that candidates succeeded in the course with the minimum of stress. But life isn’t like that and neither are people. Even those who start a training course with no prior teaching experience are still deeply influenced by the apprenticeship of observation, so we are aways dealing with people with prior experience. This being so, why single out those with a particular kind and consider them to have more work to do in “adapting”? Isn’t it truer to say that it is we trainers who have more work to do in adapting our views and approaches to accommodate them? The real question is: who “may have trouble adapting”? The applicant, or the trainers? That list of qualities that I think would enable someone to learn from their own experience and would also mark someone as being suited to teaching are also qualities that make such a person more effort to manage – which may too often be seen as a bad thing, instead of the opportunity for growth for the course leaders that it presents. The counterpoint to the Jug ‘n’ Mug metaphor is the Drawing from the Well metaphor. The people we work with on training courses are more like a well than a blank slate – they possess something essentially important for us as educators – their knowledge and experience and beliefs – just as a well possesses something equally vital – water. But these assets are stored deep, out of easy reach. We need to dig down, draw it out painstakingly, and bring it to the surface – for only there can it be put to use. Just as water does us little good until we get to it, a trainee’s prior knowledge and beliefs won’t be any good unless they are drawn out and valued as an asset, as something that nourishes the act of development. The question is: how best to do that? Reading this post made me think back to my pre-CELTA teaching experiences. For one thing, I had been learning a foreign language for 9 months. Secondly, I had found a language school where I was living and asked them for a week of work experience, primarily to see if it was the idea of travelling that attracted me or if ELT interested me as a career option. It turned out to be the latter. A CELTA timetable is already strapped for time with all there is to complete. How much of the pre-course material do you think should serve to make trainees aware that they have beliefs about teaching and learning? Could this create more problems than it seeks to solve in the first input session? Thanks for commenting, Dale. You raise a very big question, and one which I doubt I’ll answer adequately! I suspect the experience you describe is similar for many trainees: they want, understandably enough, to “learn how to teach properly” – by which “be taught how to teach” is more likely meant if you dug a bit deeper. As I say, perfectly reasonable desire, but, when you consider the gravitational pull of the apprenticeship of observation, profoundly problematic. So on the surface, yes, I do think more time should be spent on focusing trainees on questions that are implicated in a belief like “I want to learn how to teach properly”. Questions like “when I think of classrooms and lessons, what are the first 5 activities that come to mind – and how do the memories make me feel? What memories do I have of feeling happy while learning something in a classroom? When I think of my lessons at school, who is most present: myself and a book, my classmates, my teacher? Did I enjoy the lessons at school (as opposed to the time spent at school)? is there a language that I want to learn but haven’t yet – and if there is, what has stopped me from going to classes – and if there isn’t, why do i want to teach a subject that I have no burning interest in myself?” etc. One of the things that has been on my unplugged to-do list for a long time now is to create a series of pre-course tasks which are more geared to how I want our course to work, and that means spending more time exploring these deep currents of established tacit beliefs which invariably influence surface behavior. Two things, I think, stop me: firstly, I’m not sure how to design tasks to get at these beliefs at distance, and secondly, I am not sure about the extent to which these outcomes could be leveraged throughout the course: by which I mean I am unsure about my ability to do so. the questions I brainstormed above are interesting but need a lot of refining! An option I’d very much like to work with is to abandon the post lesson self evaluation and replace it with a daily journal; this would, I think, make many things going on “inside” more accessible throughout the course: of ourse, we would have a lot more to read but I suspect it would be interesting reading! Really interesting post Anthony. It’s always great to get an insight into your work. If a ‘blank slate’ is better for the CELTA then how about for the DELTA or MA?. EFL journals seem to be full of adverts for these courses and some appear to be available for people with little or no teaching experience. Education in this sense has become a business and so there must be a customer-supplier relationship there too where it is badly seen to fail candidates and thus some courses get a reputation as a guaranteed pass (my friend attended one for the CELTA, or so he said). Do you think this is the case and what do you think about offering MA courses to people fresh from BA studies? Also, should schools insist on a minimum of 2 years between CELTA and DELTA or is more better? Thanks for commenting, Phil: I think that there’s nothing wrong with straight from MA to BA in general, but anything to do with teaching is essentially a practical enterprise to me and so the higher the level of study, the greater the need for practical experience. This begs the question whether degrees in ELT (choose yer acronym!) should have mandatory practicum, of course!. I did my Delta after the equivalent of 5 years or so of full time teaching: I think that was right for me. I can’t speak for others but I think two years of varied experience sounds like a reasonable minimum. By the way: I didn’t want to say that blank slates are better; just superficially easier to deal with but essentially a deception! I like your idea of ditching the post-lesson eval in favour of a journal. At uni I used to have about 3-5 of these to fill out which usually happened on the train on my way home and lots of ticking. Very little reflection or deep thought. A journal would be good, especially if it is free for the trainers to write what they want without fear or being wrong. It might also be good to do it later as opposed to straight after the class. You could take it one step further and have group journal discussions or sharing between peers. I used blog learning journals for my students on my DELTA project which has real potential. I saw a very good Venezualan tech teacher who asked every student in her class to set up a blog on the first day to record new work, add links, cross-post and share info. They also had reflections on there I think. It worked because they weren’t monitored or corrected. I think that’s the real trick, Phil: how to let the journal be candid and voiceful (my new word for the day) while still being, partially and indirectly, subject to evaluation. As I recall, journal use is more common on courses like Trinity CertTESOL or the SIT TESOL – I wonder if any practicing trainers or graduates from those programmes could shed some light? I think you touched on an interesting point there Anthony about the journal. And as you probably know, I am a big fan of reflective journals. Firstly I think it provides a space for the teacher’s developing voice throughout the course. How, with each practice lesson and each input session, the trainee’s opinion emerges and becomes more solid. I was rereading some entries in my journal from the DELTA days a few weeks ago and I found it interesting to see my opinions developing throughout the course. What struck me was just how quickly they translated to the classroom. I would be curious to see which teaching skills or which input sessions diffuse into trainees’ opinions of their classroom practice… in this way a journal would dig much deeper into currents of emerging beliefs? Put it into practice early on, and, if trainees then benefit from it, do you think they would be more likely to continue with it after the course? Forming good habits on CELTA for reflective practice, which trainees then use in their first years of teaching, sounds to me like a step in the right direction. I would be interested to see the criteria for evaluating the journal, and also what an example of a pass, B and A would contain. The questions your proposed for mining trainees for their opinions and are directed towards experiences, which seem better than “what do you think makes a good teacher” style questions or “what do you think of X classroom behaviour”. How do you work with the answers? Would the journal have a role to play in this process? I’m not surprised that you are a fan of journals, Dale – and in yours is an MA diss waiting to happen, I suspect 😉 I think the idea of “getting em while they’re young” with reflective habits is a good one, and I really must make a move on this. Your point about not all opinions being correct is also very germane to any discussion of short, intensive assessed courses; with mroe time and less assessment pressure, you could say “OK, that’s what you believe – go and do it and see what happens”. Maybe it will work despite the tutor’s incredulity, perhaps it doesn’t. But it will have been tested to destruction. We try to allow a certain amount of this latitude but we’re human and pull the reserve parachute in the form of “I really strongly suggest you re-think that…” – responsible or cowardly? BTW: I know I have only responded to half your excellent points: I simply have to get back to marking assignments etc! So sorry but (in with words of MacArthur) I shall return! I may have mentioned this before, sorry but here is a spruced up version. Having an online discussion with students could work well but instead of setting 5 questions you could introduce the topic with stimulus such as a photo, video, anecdote etc and then let the discussions develop naturally onto these areas. Of course the first posts may be very shallow but as people grow in confidence and discuss together each other’s ideas more reflection should appear. You could set basic rules that everyone must contribute and start a thread and then introduce a new topic every week/days. The first class could then be a summary or further reflection, goal setting and an introduction to reflective practice. Maybe having a regular informal discussion over lunch once a week might also be a good time to see how people are moving on personally. It’s when I read such evocative ideas like these that I rue having such little time to play with! Hmmmm. Avoid taking in and writing in red pen perhaps. Actually, you might not really need to read the journal at all and it would break the whole ethos of being ‘personal’. It is just a place for noting down thoughts and ideas which may be more ‘works in progress’. Could students hand in a weekly reflection essay or letter or just hold a 20 minute Q & A between everyone on a Friday where each person talks for a minute: “this week…” and then answers some friendly questions. I think those are all great ideas, Phil, and I hope you don’t mind my using them! Unfortunately, though, some form of written evidence of a trianee’s capacity for reflection is bureaucratically necessary, so a journal that can’t be read would not help there. As you say, though, some form of summary could work – but how to do that without adding even further to the workload is something that would take some working out! How about a weekly or end-of-course reflection essay? They could do their regular weekly online discussions or tweets between themselves. You could even encourage them setting up video diaries as opposed t journals as it would be easy for them just to record a few thoughts now and then and at the end of the course to review them and see how their ideas have changed. This could then provide all the info for the final course reflection. The key would be time efficiency and maximum reflection. Starting all this before the course would help a lot. This would not require any extra work from you. In theory. I like the idea of video reflections – tools like MailVu and Jing make mashups of trainee and tutor exchanges possible with little technical nous. The sooner ePortfolios are allowed, the better for this. Thanks for the post, Anthony. Actually I was a real black sheep on my CELTA course. I had no real previous language learning experience as an adult and a year or so of ‘teaching’ in a private language school that was actually using some watered-down form of audio-lingual for the most part. It was very hard for me to take on board the some of the new ideas and I somehow had problems with all the paper work and trainer micromanaging. In short, I was a lousy trainee. Scott Thornbury made a comment on his blog about the teacher trainer probably having to the resign themselves to just accept the particular personality of the trainee and not hoping in vain to reshape the person. Just because, for whatever reason, the training course was stressful for me (and I haven’t learned a foreign langauge), doesn’t mean I’m not suited and committed to really teaching English the best I can. Hi Mr. D – thanks for stopping by! I also appreciate that being in a classroom as a learner isn’t the same as being in one as a teacher, but at least it is a way of gaining some insight into the work while getting to learn a language at the same time – so everyone’s a winner. I suppose what really is at play here is my unwillingness to take money from someone who may – in a worst-case scenario – really have no clue what they are getting themselves into! I also wonder how learners feel about having foreign language teachers who have never tried (emphasis on tried) to learn other languages. There is no other subject that I can think of where the raw subject knowledge (not terminology) and performance skill are acquired in early childhood and are, essentially, innate as opposed to studied. This sets FL teachers apart in kind from all other teachers and coaches, it seems to me: a football coach had to master the game just like their players; a history teacher had to burn the midnight oil memorising dates and events, an art teacher had to practise at least the rudiments of working in oil, pastel etc. etc. Good to hear you have started your Delta, by the way – I wish you all the best with it! Excuse me, but as teachers don’t we have to deal with student preconceptions and prior learning experiences ALL the time. And we ARE expected to succeed. The key point here is that beginners aren’t thrown in with experienced language learners. Doesn’t the way we ply our craft offer some hints as to how we should be training our teachers? Kudos for only taking teachers who have studied a language. I’ll go you one better. As a trainer in Taiwan I once observed that teachers who were currently studying Chinese made better teachers than ones who had stopped studying. Hi ChinaMike, thanks for stopping by. I agree that learner preconceptions and prior learning experiences form part of the teaching and learning reality – but I also suspect that, as T.S. Eliot said: “Humankind cannot bear very much reality”. In other words, I suspect (fear?) that there is a fair amount of teaching going on which operates on the tacit principle that learners are harddrives that are better off reformatted. In the context of very short training courses of any kind, there is a tension between exploiting the learners’ brought resources and simply making use of what the trainer has under their direct influence. In such circumstances, jug and mug can (in more or less direct forms) kick in, even when the trainers would espouse other principles – I’ve caught myself at it often enough to know that such DoubleThink is possible! Absolutely agreed, therefore, that “the way we ply our craft (can and should) offer some hints as to how we should be training our learners”. And I fully support the use of the term “craft” (as opposed to “profession”, as there is a debate – again – about this over on ELTMythtakes. But “how we are training our learners is exactly the question: how many teachers really take their learners and their individual needs and stages of development into account in the live classroom? How many pay lip service to this while operating a coursebook unit? And to be fair, with larger classes, how far can they realistically be expected to do so, even if “we ARE expected to succeed”? This is Jeremy Harmer’s perpetual counterpoint to teaching unplugged and I have to acknowledge its basic validity as a question. Also a very interesting observation of yours – that learners who persevere in their learning also make more successful teachers. I can see lots of superficial reasons for this but what were your criteria for making the judgement? Looking forward to reading more of your comments – thanks again for dropping in! One question I’d like to raise is if it’s better to have teachers with experience of LL, how about teachers with bad experiences? A lot of people from my generation were forced to learn languages which were taught in a dull way and so we had the desire and the ability to drop languages at school. Then with the increasing use of English as an international LinguaFranca this further bolstered our negative view of learning ‘foreign’ languages. These people may get into teaching afterwards, possibly with a desire to teach better than they were taught BUT how would this ‘negative baggage’ affect them and their CELTA learning? Unless it’s 1-to-1 it’ll be pretty tought to be 100% focussed on 1 student but even then he/she may be influenced by the context and the teacher so won’t be completely natural. In a group setting behaviours often blend and group mentalities form and evolve, particularly in some ‘group-oriented’ cultures. There is also the chance that if everyone is at the same level (say pre-int) that an emerged problem with student X (say present perfect) is also a problem for student Y. Groups are possibly where Dogme works best because there is more focus on student intereaction and noticing of each others language. Best of all though, is that the EFL learners are talking to ther non-natives which they will be doing back in their country. OK. I’m getting off the soapbox. Great reply. It sent me on a 1 hour web adventure following your link. One disclaimer before I start. I consciously tried my hardest not to be a jug and mug type trainer in the school where I worked because I felt that too many teachers would tune out for all the wrong reasons (starting with because I held the power). Long term, I think the best teachers are consciously reflective and so I felt I did my best work when I started getting a teacher to start down this deep path. Anthony, I’m not sure I understand your question which is not a great way to begin an answer (sorry). In the context of my situation I found that students who were spending time learning Chinese (vs. those that had stopped learning for whatever reason) were under no illusions about the difficulties involved in learning a language. Those difficulties mean that the individual must take personal responsibility for a great deal of his learning. Teachers who were studying as they taught seemed to be able to leverage their own experience to help learners learn. I also think I remember that the best teachers in this group were those that were studying at about the same level as the students they were teaching. If this actually held true (I had a small sample) then it would suggest that teachers have a “natural” affinity for different levels, and that the job of the administration is to discover what this affinity is. Thanks Mike, that’s very interesting. One implication does seem to be that the better a teacher gets in an L2, the less able they are to relate to low level learners: which is a powerful argument for language teachers regularly starting to learn new languages!